War is hell. War kills people, mainly non-combatant civilians, and injures and maims many more — both physically and psychologically. War destroys the health-supporting infrastructure of society, including systems of medical care and public health services, food and water supply, sanitation and sewage treatment, transportation, communication, and power generation. War destroys the fabric of society and damages the environment. War uproots individuals, families, and often entire communities, making people refugees or internally displaced persons. War diverts human and financial resources. War reinforces the mistaken concept that violence is an acceptable way of resolving conflicts and disputes. And war often creates hatreds that are passed on from one generation to the next. 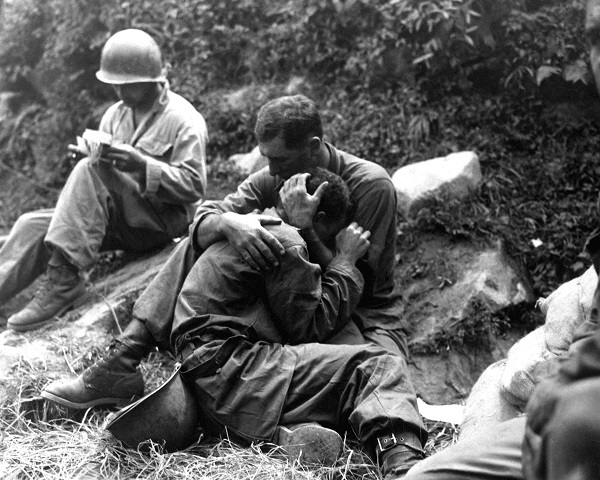 During the Korean War, a grief stricken American infantryman whose friend has been killed in action is comforted by another soldier. In the background, a corpsman methodically fills out casualty tags. Haktong-ni area, Korea. August 28, 1950. Public domain via Wikimedia Commons. War is hell. Yet we, as a society, have sanitized the reality of “war” in many ways. In the absence of a draft, many of us have no direct experience of war and do not even personally know people who have recently fought in war. And the US Congress has long since ceded to the President its authority to declare war. We envision a world without war and see the need to develop the popular and political will to end war. To create a world without war, we, as a society, would need to stop using sanitized phrases to describe “war” and to stop thinking in a militaristic context. But much more would need to be done to create a world without war. A central concept in public health for the prevention of disease is the use of a triangle, with its three points labeled “host,” “agents,” and “environment.” This concept could be applied for developing strategies to create a world without war — strategies aimed at the host (people), strategies aimed at agents (weapons of war and the military), and strategies aimed at the environment (the conditions in which people live). Strategies aimed at people could include promoting better understanding and more tolerance among people and among nations, promoting economic and social interdependency among nations, promoting nonviolent resolution of disputes and conflicts, and developing the popular and political will to prevent war and promote peace. Strategies aimed at weapons of war and the military could include controlling the international arms trade, eliminating weapons of mass destruction, reducing military expenditures, and intervening in disputes and conflicts to prevent war. Strategies aimed at improving the conditions in which people live — which often contribute to the outbreak of war — could include protecting human rights and civil liberties, reducing poverty and socioeconomic inequalities, improving education and employment opportunities, and ensuring personal security and legal protections. War is hell. A world without war would be heavenly. Barry S. Levy, M.D., M.P.H. is an Adjunct Professor of Public Health at Tufts University School of Medicine. Victor W. Sidel, M.D. is Distinguished University Professor of Social Medicine Emeritus at Montefiore Medical Center and Albert Einstein Medical College, and an Adjunct Professor of Public Health at Weill Cornell Medical College. Dr. Levy and Dr. Sidel are co-editors of the recently published second edition of Social Injustice and Public Health as well as two editions each of the books War and Public Health and Terrorism and Public Health, all of which have been published by Oxford University Press. They are both past presidents of the American Public Health Association.